We will be featuring different members of the Brilliant community, so that you can get to know them better. For the thirteenth issue, we are featuring Ahaan Rungta, who recently made the news for being a 15 year old MIT student. I am a freshman at MIT. I currently do not know exactly what I want to do in university, but I hope to major in something related to math and/or computer science. Luckily, due to MIT's diversity and broad curriculum, I would not have to decide for a while. Apart from classes and PSETs (problem set assignments), I enjoy the clubs I am in, which include MIT's Tae Kwon Do team, the Educational Studies Program, and being an officer of the Harvard-MIT Mathematics Tournament. Also, I am continuing a few things that I did in high school, including my contest CalcBee. I am also currently a UROP student, researching in biomathematics, thanks to MIT-PRIMES, which I was a part of in high school. I like to let my passions and circumstances take over my destiny. So far, it's worked out wonderfully. 2) Tell us something that the Brilliant community doesn't know about. I can speak Greek reasonably well, can play the cello and piano reasonably well, can play chess reasonably well, and can play multiple sports reasonably well. Right now, I'm kind of a jack of all trades, master of none. 3) What inspired you to use OCW to learn math and science? It mainly stemmed from the fact that I was in a part of Florida where the school system was not at all captivating for me. This forced my parents to want to homeschool me, after which my mother found out about OCW. The simple teaching style by the professors and the non-complex curriculum made learning easy for me. Soon enough, I was beginning to love college-level math and science, something a lot of people can't do due to its inaccessibility. OCW did not bridge the gap between high school and college for me -- it removed that gap. 4) What was the process that you used? Did you have to take a course multiple times to understand the material? When I started on OCW, I used high school highlights, after which I felt I was ready for a lot of the college material, so I learned math, physics, chemistry, and computer science using the courses in OCW, pretty much in order of their course number in MIT. For example, in math, I progressed from 18.01 to 18.02 and then upped to 18.022, then 18.03, etc. I found that the course numbers are a pretty good approximation of the order it is easiest to learn in. Most importantly, I did not rush into moving from one course to another. Rather, to begin with, I spent extra time listening to all the lectures, perhaps sometimes multiple times, and solving all the problems and using all the supplementary materials on each course so as to not rush the learning procedure. 5) What advice do you have for someone who wants to follow your footsteps? My first advice is to not follow any person's footsteps. I believe that every person was born for a different purpose and that life was designed to make every person unique. The differences in trajectories of every person's life are what make our planet so interesting. Instead of trying to do something someone else did, I think we should all just do what we love the most, without regard to orthodox methods. I was homeschooled because my parents knew that would make me the happiest. I believed in myself in everything I did because I did not think of failure -- I knew, if I were following my dreams, I couldn't regret it. Chase your dreams, no matter what they are. 6) What issues do you face being a 15 year old freshman at MIT? I actually don't face many challenges at all at MIT. One of the things that make MIT the most awesome place in the world is the welcoming community. At MIT, every one of us are part of a big family, no matter what our interests and backgrounds. In fact, many have told me, after they find out how old I am, that they never realized I was younger than them. I have not had any issues with communication or with the workload at MIT so far. I should probably attribute some of this with the preparation I had in high school -- from making use of college level material with OCW and edX to interacting with some of the brightest minds in my age group in Brilliant, my high school years have transitioned quite nicely into the MIT community, and I look forward to the years I have remaining at MIT. 7) What do you wish for Brilliant? Brilliant has evolved a lot in multiple fashions since I first joined. While a lot of things have improved, I honestly loved the pure quality-over-quantity version of Brilliant that I started with. I learned a lot mainly from the comments I got from other students and the admins. I remember being very consistent with trying to post solutions for almost all the problems for which I could, which turned out to be a good idea. I always learned from the other community members and Calvin's advice was a big part in making me a good formal mathematics writer. I'm thankful for all the time I spent beyond just trying to solve problems for their answers. While the community growth on Brilliant has been exciting, I feel that Brilliant has a lot of work to do in terms of getting back to not being overpopulated on places like the forums and problem threads. I hope that, eventually, Brilliant can be much more of a learning pathway that it used to be rather than a mathematical social media. I am thankful to Brilliant for the amount it has made me learn more than anything else - I want that to continue for generations to come. It is an honor to be featured on Brilliant. Thank you so very much, @Calvin Lin! "While a lot of things have improved, I honestly loved the pure quality-over-quantity version of Brilliant that I started with." I've heard a number of members make the same kind of complaint, i.e., "there was a time when Brilliant was a forum on truly serious problems and solutions", and "but now it's sort of devolved into something more for the general market". Why can't we have both? Brilliant.org has been making an effort to allow members customize the "Brilliant experience" to suit their liking, and I believe progress has been made. Someday it should be possible for you to just toggle Brilliant.org back to the way it used to be. Ahaan, I feel privileged to be associate you, a 15-year-old MIT student. I could only dream to be studying there. Looking forward to hearing more good news from you in the future. @Ahaan Rungta I saw that u had learnt calculus at the age of 7. Salute to you! I just wanted to ask u through which procedure did u go to mit? Did u give sat? Thanks for the compliments! To answer your question, there is no procedure to get into any college besides the fact that you should apply. This is especially the case for MIT, since there is no set of rules or criteria for getting accepted. Yes, I took the SAT since colleges require a score to be submitted. I did not do well at all however, so this is no indication of anything important. I know several students who got 2300+ on the SAT and got rejected from MIT, while a 1950 got accepted. The two simple reasons MIT doesn't pay much importance to the SAT are: a) they don't accept numbers, they accept people, b) the SAT is not a good indication of how good you are at math/reading/writing anyway. I highly encourage everybody who asks me about college to pay as little attention to the SAT as possible. On the general scale, MIT doesn't have a general scale. In other words, MIT admissions officers take into account several factors when going through applications. I can guarantee you that looking at numbers is not one of them, and I highly doubt looking at grades in school is one of the top priorities. At MIT, I've learned that each one of us are unique in their own way which is what makes this place so diverse. That being said, we all have something in common -- we are all genuine people who are really passionate about at least one thing. In my case, this would be a mixture of things like mathematics, computer science, physics, and sports. Assuming you are in high school, and planning to apply to MIT, the only thing I'd really like to emphasize is -- when writing your essays, display who you are, not what you think they want to see. If MIT is indeed the place where you'd be the happiest, they'll figure it out. And last but not the least, be confident and enjoy what you do. Here is the scatter plot of MIT applicants. Wouldn't it be selling someone short, by telling them not to worry much about test scores? I believe it is true, that people at the bottom end of the spectrum usually have a truly exceptional story to tell. Also note there are more red dots than the scatter plot is showing. @Beakal Tiliksew – Thanks for the response. I have been busy, therefore the late reply. Your logic has holes. 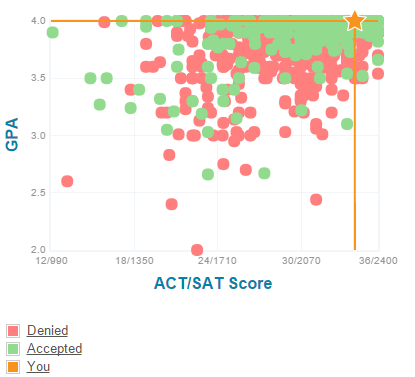 The scatterplot you show compares GPA, ACT/SAT score, and a much of data points of acceptance/rejection. Notice how there are so many outliers that you can't even call them outliers anymore -- the fact is, acceptance has no proven correlation with SAT/ACT score. Yes, a lot of green points were dense in the high SAT score region, but that's just because students who are well-rounded in mathematics, reading, and writing (who, because of that, have a high chance of getting accepted to a good college) also happen to do well on the SAT many times. This is not even true in the general case. For example, I, and many others who I know, got a well-below-average SAT score and got into MIT while someone with a 2400 with a highly unremarkable life story and no specialty besides test-taking has gotten rejected. In general, I feel this is the case. Now, my point wasn't even to say that the SAT should be given no regard. In fact, to submit an application, you have to submit an SAT score. My point was that, by my experience, students who take the time to care about SAT scores have a lower chance to getting into their desired college than students who focus on school and their real interests and actually don't care about the SAT. I, for example, never cared about the SAT, would never recommend it to anybody, and if it were up to me, I would ban it. However, these are my opinions which nobody really cares about. I believe that, in due time, colleges such as MIT will vocally start disregarding the SAT and it will be clear how utterly useless and unrepresentative it is of real talent. It's just a matter of time before it's official. For now, I'd just like to clarify that, while I think the SAT and ACT are outright nonsense, it is still necessary to submit a score to colleges and make sure it's not extremely low (to be on the safe side), but it is unnecessary to practice for it to the extent that you are sacrificing your real interests and stunting your mental growth. -Statistically speaking the higher are your sat scores the higher are your chances of being admitted. For MIT, according to admissions calculator a person of lets say an average score of 1800 has only a mere 0.5% chance of acceptance. While a person of the same GPA, but an SAT score of 2400 has an incredible 19.4% percent chance of acceptance. It is a big difference if you think about it. A one in five person chance of acceptance is way way way better than a one in more than 100 applicants. The importance of the SAT is actually indisputable. Consider person A who goes to a very rigorous school with grade deflations and gets a GPA of 3.6, and person B who goes to a rather loose school and gets a GPA of 3.9-4.0. How would it be fair for admission officers to fairly asses both students. What is needed here is a test that will equally asses every individual equally. That is were the SAT comes in to play. Besides the new SAT is coming and it is going to be way easier and less discriminating. @Beakal Tiliksew – The numbers above don't mean that much, since a fairly smart student will do reasonably well on the SAT because it is so trivial. My point is that SAT is not the right basis (and, therefore, MIT does not use it as the primary basis). Your point is valid but it does not refute mine. @Mehul Arora – No problem! Thanks a lot! You have opened my eyes about the SAT exam. The only thing that stops me from going to MIT is the fee structure. I'm from a middle class family. My parents can't afford to pay such a heavy amount. Is there any scheme for scholarships? @Aditya Kumar – Thanks for asking this. It is yet another misconception that MIT does not provide financial aid. It is another (disjoint) misconception that MIT provides financial aid either randomly or by merit. MIT provides generous need-based financial aid for anybody who gets in. The logic is, if MIT thinks you are ready, they will accept you without regard to your financial status. The aid is just another step, after acceptance, to make sure they are doing the best they can to make it possible for you to come here. While I do not want to reveal my financial details, I will tell you that, during my high school years, money was tough to come by and I witnessed my parents struggling a lot with finances (and many other families as well). I am sure many others who attended MIT will agree with me that MIT tries their best to make it possible for anybody to attend, if they have been accepted. There have been many stories of homeless children having the zest to come to MIT, getting accepted, and then being able to attend due to the complete lack of compromise MIT has when it comes to funding. I'd like to close out by saying that merit-based scholarships are rare but need-based financial aid is there for you to take. And you can only find out if you apply. @Ahaan Rungta – So now a person like me from a middle class family from India can dream of MIT. Congrats @Ahaan Rungta for being featured. Congrats, Ahaan to be featured ! You will be much needed in Brilliant Community.